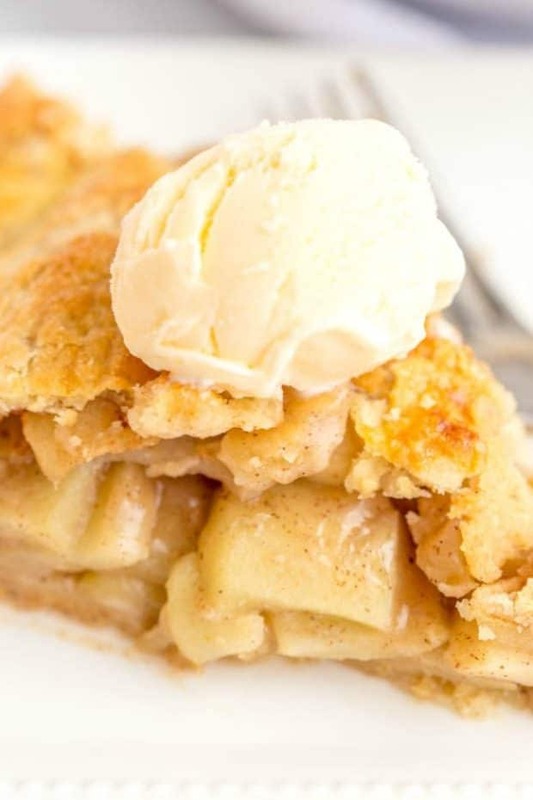 This simple, homemade deep dish apple pie recipe is the best old fashioned dessert to enjoy! I’ve loved food for as long as I can remember. As a small girl, I can vividly recall afternoons spent sitting on the kitchen counter at my grandparent’s house. As the official apple pie helper — a title and job I took very seriously. I helped pour, mix — and of course lick the spoons — of all the delights my grandma was concocting. Before starting, my grandma would remind me to wash my hands and tie on a faded floral apron. Then I would hop up and settle in to assist. I loved feeling like I was part of the project. I never wanted to miss anything! Many of my favorite recipes today are treats I baked with my grandma as a little girl. I love them even more now than I did then. Some of her recipes I’ve left alone and some I’ve tweaked just a little. They’re all delicious though — I’m going to be sharing one with you today that I think you’ll especially like. 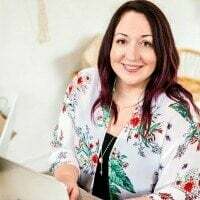 But first, let me tell you a little bit about another kitchen adventure I recently had. 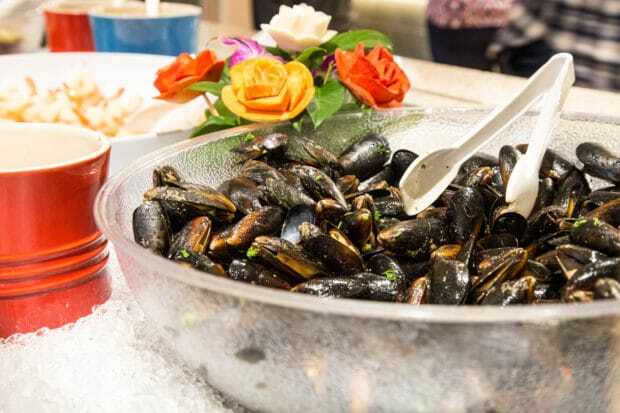 Today’s vacation memories and delicious recipe are brought to you in partnership with Princess Cruises! If you didn’t know, Mike and I recently had the opportunity to take a Princess Cruise to Alaska.It was the fruition of a lifelong dream for us. It really was an amazing trip. (You can read about Alaskan Cruise Essentials if you’re getting ready for your own adventure). During the cruise, we went whale watching and sea kayaking. Both were incredible. We enjoyed all the on-ship amenities. We marveled over the incredible views. There was so much amazing food. It was a foodie’s dream come true. 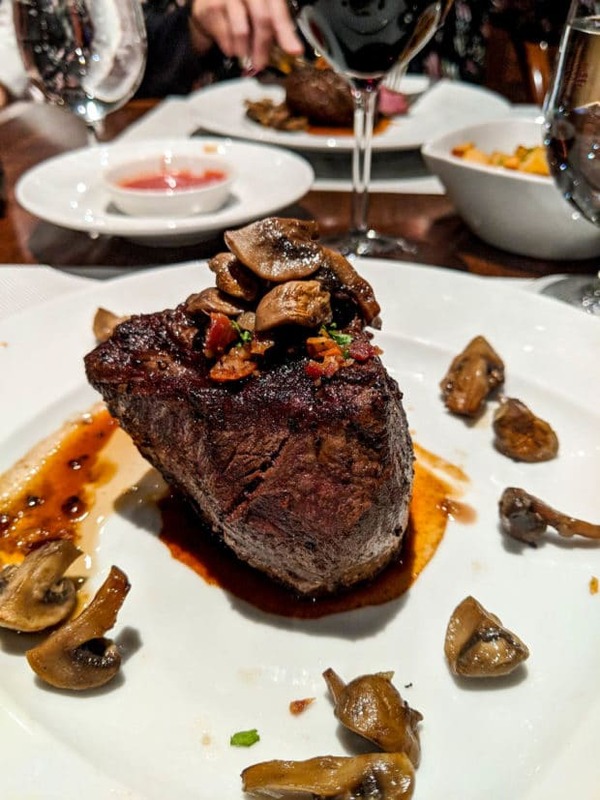 There are a number of restaurants to choose from on board — literally anything your heart or taste buds could want is available to you. And not just available, but mind blowing. I was constantly wowed by the delicious meals we had. There were so many options, as soon as we boarded, I made it my goal to try as much of it as possible and really savor the experience. We found fresh and authentic Cajun and Creole cuisine (I tried alligator for the first time! 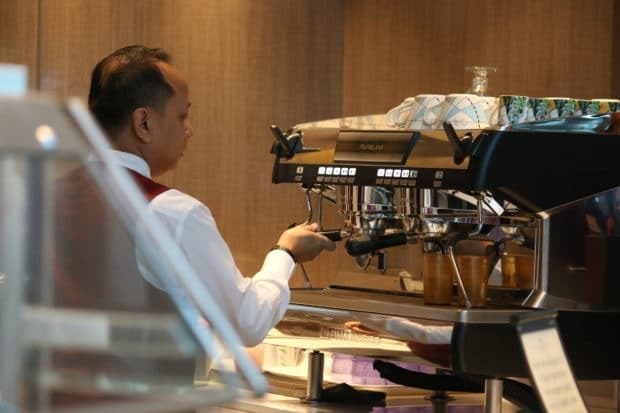 ), authentic Italian (where I had the most delicious souffle for dessert) and a couple of areas where you could get high end coffee (and I had my daily latte fix). 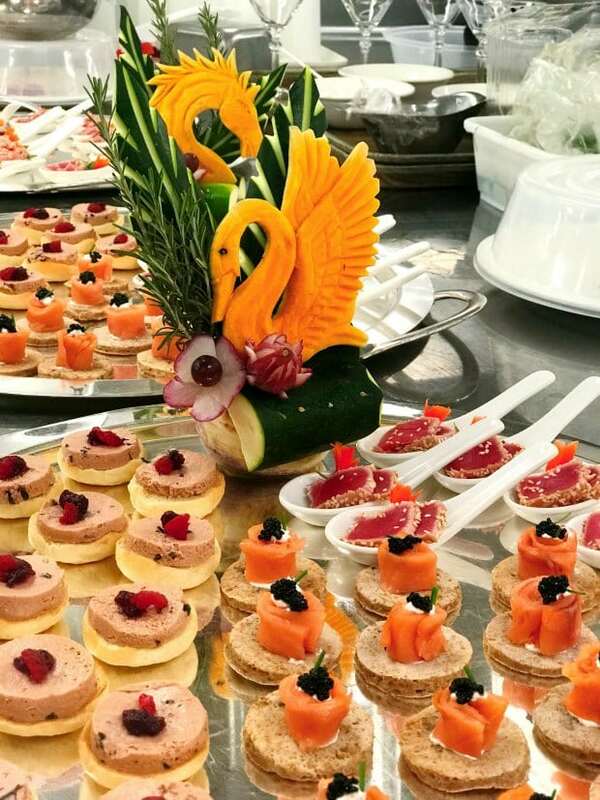 Some cruise guests even get the chance to have a ship’s chef create a specially designed menu for you to enjoy. I also actually loved the buffet. It was a fantastic option to the “sit down” meal when you wanted something fast. The food was always plentiful and the variety was fantastic. We ate there several time times — breakfast before excursions and a quick bite before time with friends. Oh, and there was a chocolate shop. Give me all the chocolate, please! Our entire trip had the very best fresh produce and vibrant, bold flavors that have left my mouthwatering ever since returning home. One of the best experiences we shared while traveling was the opportunity to have a kitchen tour. I may have grown up, but inside I’m still that little girl that likes to see behind the scenes and be involved in the kitchen! The kitchen tour was fabulous — watching so many of the dishes being prepared by professionals was so much fun. Not only was it entertaining, it was so informative. 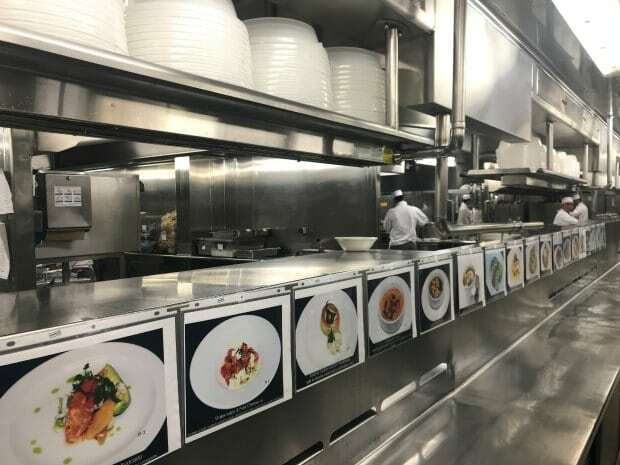 Our guide took time to talk about all of the inner workings of a kitchen that needs to feed a massive cruise ship, which was really interesting to someone like me who loves food. While we were tucked away in the kitchen, one of the recipes we saw being created was a deep dish apple pie. You guys, when I tell you that I fell in love, I am not exaggerating. I couldn’t get enough of this apple pie. From the flaky crust to the fresh apples inside, every bite of this dessert was wonderful. When we got home, it was one of the recipes I couldn’t wait to pull out of my trusty old recipe box and recreate. 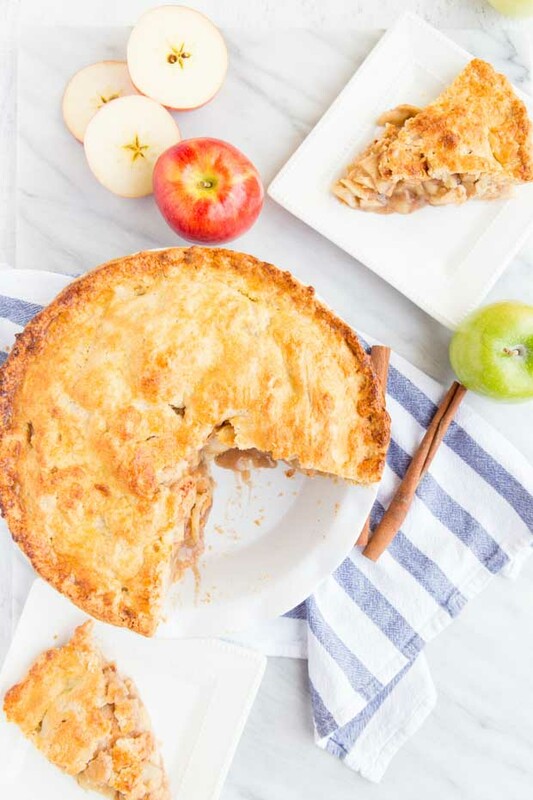 This easy deep dish apple pie recipe is the result. I think you’ll agree that it’s magical. For the crust, you’ll need flour, unsalted butter, salt, sugar, chilled vodka and ice water. We’ll also be making an egg wash with egg and sugar for the crust. For the filling, you’ll need apples (mix of granny smith, honey crisp, and pink lady), sugar, flour, cinnamon, cloves, nutmeg, lemon juice, brandy and butter. Now, let’s make some magic happen. If you haven’t made a deep dish pie before, don’t be nervous. 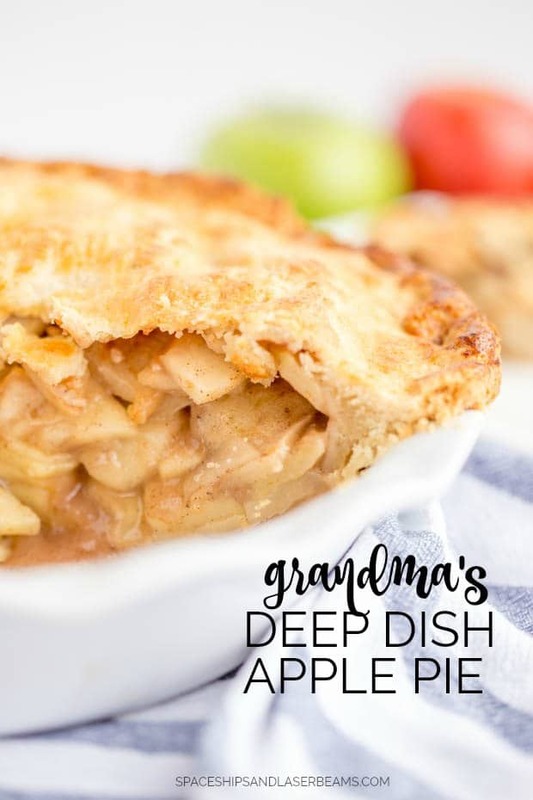 It’s simple to create the best deep dish apple pie from scratch! First, in a food processor, pulse together the flour, salt, and sugar to combine. Cube butter and add to the flour mixture. Pulse a few times until you have a crumbs the size of peas. Drizzle vodka and 2 TBSP of water as evenly as possible over the mixture. Pulse a few times. Pinch the dough, if it holds together remove from the food processor and divide in to 2 disks. If the dough crumbles, add 2 tsp of water at a time and pulse. This will be different depending on the humidity. Wrap each disk in saran wrap and refrigerate for 30 minutes or up to 2 days. While the dough is chilling, peel, core, and cut apples to 1/4” thick. 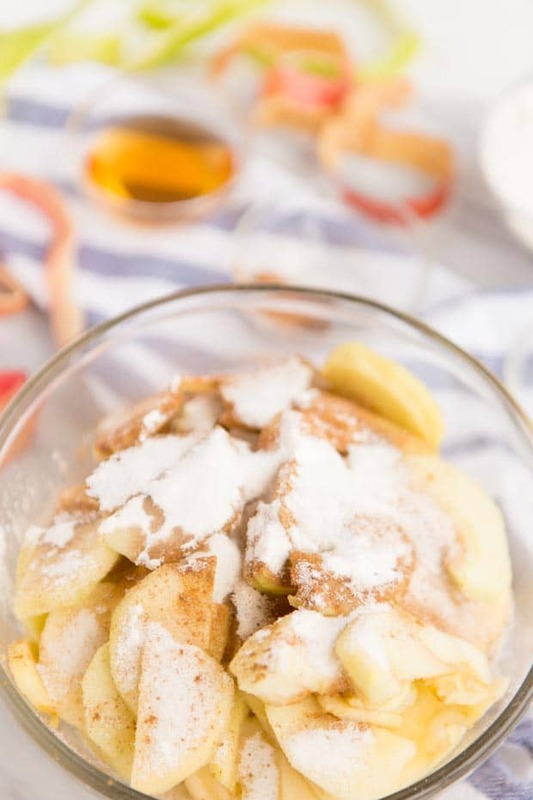 In a large bowl, combine apples, sugar, flour, spices, lemon juice, and brandy. Mix well until apples are evenly coated and set aside. Roll out dough on a slightly floured surface. Roll out to a 1/4” thickness, if you get holes don’t worry, you can patch them. Gently transfer the crust to the pie dish. Layer apples in a circular pattern and sprinkle with frozen butter. Roll out remaining dough to 1/4” and cover apples. Trim off excess crust and crimp. Whisk the egg and brush over the entire pie. Sprinkle with sugar. Cover with aluminum foil for 20 minutes. Then remove foil and bake for an addition 40 minutes or until apples start to bubble. Let stand for 1 hour and serve. I served ours with a scoop of vanilla ice cream on top… which is the perfect way to enjoy this treat in my opinion. Once you try it, I’m sure you’ll agree it’s delicious. 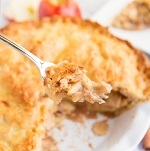 I hope your enjoy this recipe for deep dish apple pie soon — and maybe a cruise to Alaska as well! Psst, I think you’ll love this pie crust recipe. 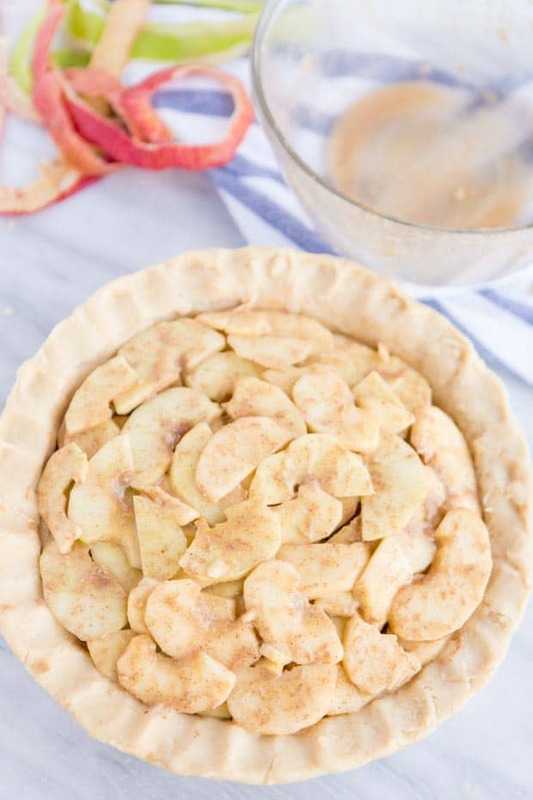 This incredible and simple deep dish apple pie recipe is the perfect old fashioned dessert! 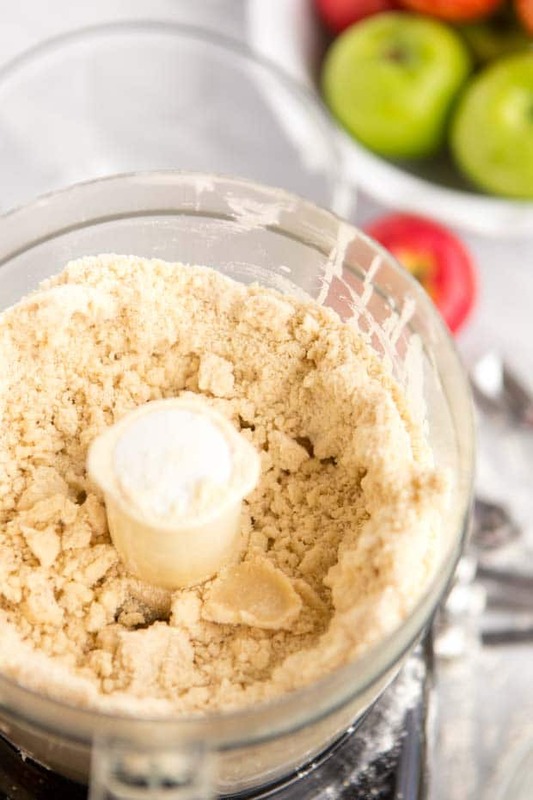 In a food processor, pulse together the flour, salt, and sugar to combine. Cube butter and add to the flour mixture. Pulse a few times until you have a crumbs the size of peas. One of my favorites! Sooo delicious. Wanna try it again.